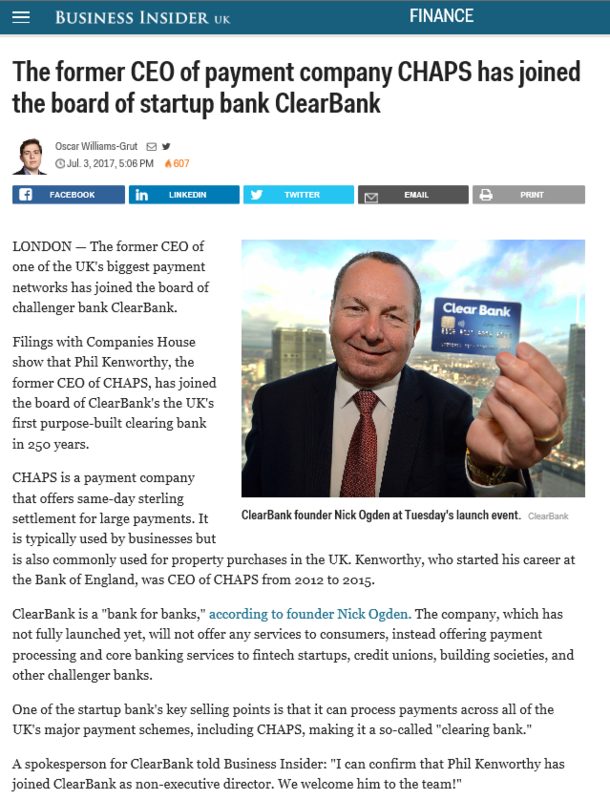 In my last year as CEO of CHAPS (the UK’s High Value Payment System), I became increasingly interested in the opportunities that Distributed Ledgers could create; not in the crypto-currency world but in the existing world of “real” payments. At present in the UK, payments operate on separate ledger mechanisms which echo the past in terms of their structure. All existing core Payment Systems in the UK operate by settling the obligations from one of their Direct Participants to another across settlement accounts held at the Bank of England. For those institutions that are Direct Participants in the Payment Systems, their settlement accounts at the Bank of England are normally directly linked to their Reserve Accounts (thus enabling them to participate in the Bank of England’s “Sterling Monetary Framework”). At present, over 150 institutions hold Reserve Accounts at the Bank of England (http://www.bankofengland.co.uk/markets/Pages/money/smfparticipants.aspx). As such, it could be argued that these form the Central Ledger for £ Sterling and the account structures held within each of the participating Banks to keep track of their customers’ balances form separate “nodal” sub-ledgers. A customer’s “nodal entry” balance may be positive or negative depending upon whether they are in credit, overdrawn or have authorised loans with that institution that exceeds their credit balance. Collectively (and keeping things simple for illustration’s sake), it could then be stated that the daily payments between Banks on behalf of either themselves or their customers takes place within a Closed Network Group of authorised institutions. Unless the Central Bank has released “new money”; it remains a “sealed” Group operating within the total value of £ Sterling in existence. As such, all daily transaction flows between those participating in the “eco-system” therefore net out at the end of the day. At its widest level, this eco-system encompasses all entities and systems which require the movement of £ Sterling to operate. Payment Systems are currently the means by which the instructions to move monies from Banking Institution A to Banking Institution B (on behalf of their respective customers) are securely transmitted and processed. We currently have several in the UK which reflect the differing means of money transmission; CHAPS for real-time guaranteed High Value Payments and Cheque and Credit Clearing (for when a paper instrument (the Cheque) is used by a customer as their instruction to credit funds to another party who banks elsewhere in the UK Banking System) are two examples. These payment systems therefore act as the interface between the “Central Ledger” and the “Nodal Ledgers” held at the Banks and other Financial Institutions who participate in our payment “eco-system”. They need to be secure, trusted and resilient. Erroneous or illegal transfer instructions purporting to represent the wishes of a customer to transfer funds elsewhere cannot and must not exist. The collective needs and wants of the various players participating in the existing UK Payments arena therefore mirror closely the underlying aspirational attributes of a distributed ledger system; a single, secure, trusted ledger mechanism where authenticated transfers between Financial Institutions and their customers take place legitimately and without impediment. A lot of work and thinking is taking place within the UK Payments Industry at present to determine its future shape and strategy for the next 10 years. In my last post, I highlighted the core objective of the new Payment Systems Regulator around innovation and the aspiration within the payments industry to look to consolidate a number of the payment systems and to operate to common data and message standards. These remain key objectives. The question is whether any aspect of the logic backing the distributed ledger process could be brought into use as part of the forward looking payment system design? This would not be without considerable challenge. The distributed ledger process present behind Bitcoin requires the full ledger to be present on all nodes with authorised data miners utilised to validate transactions over a specified time period. The sheer volume of payments initiated in the UK on a given day raises the key obstacle of how a similar mechanism could work. However, maybe this could be addressed by utilising the current banking structure and considering it in a slightly different vein? What if the Banks were the authorising “miners” in the Bitcoin analogy? What if full Distributed Ledgers were held at the institutions that held authorised Banking Licenses with legal authority for Settlement Finality still vested with the Bank of England as the repository of the Centralised Ledger? The two banking parties in a transaction on behalf of their respective customers would provide the authenticated bi-lateral adjustment on the distributed ledgers that would then be adjusted at the centralised ledger in the name of their own institution. The centralised adjustment could be real-time or in netted blocks thereby representing the Deferred Net Settlement status currently present within existing Payment Systems such as Faster Payments. As I said at the beginning of this post, we already operate a simpler form of discrete ledgers already. The big step would be to extend the model so that the Banks would not just operate their own ledgers but that for the broader banking community. The Payment System would then become the network and rules mechanism by which the transactions would take place. The audit trail of transactions conducted through the network could be managed by The Payment System and would become, by default, the UK Payment Transaction Repository which could then be utilised as required by Government and law enforcement agencies in terms of the data that it would hold. The above is just food for thought. However, as the various parties in the UK Payments arena formulate their thoughts in the coming months on the future structure of the underlying systems and infrastructure, it would be a pity if thought was not given to whether the UK could somehow leap-frog one or more interim steps to the next level of evolution.